Little Boy tells the story of a young child who has his partner, his father, taken to War. He then meets different people who build relationships with him and starts growing his strong faith. This story is about believing in what people think to be impossible or hard to get to. The lead is a short for his age boy who gives adorable presence to the character. His father always asks the question “Do you believe we can do this?” in the imaginary worlds that they both play into. The boy has a very close relationship with his father which I believe every son desires. I do have to point out the scene where the little boy is bullied and then thrown in a dumpster while his father is shown ambushed in the Philippines. The parallel shots of those events were a striking move from the filmmakers. The little boy is taken away with this magician character he meets at a show. The magician urges him to “Ignore the world, focus on doing the impossible” which is another lasting line from this small film. The two major lines mentioned serve to put the steak on the plate of the theme if you will. 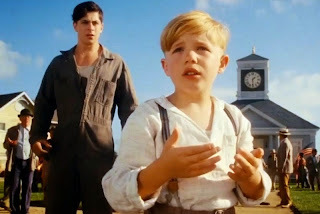 There is a Japanese man who lives in the World War II era town with the boy who ends up being a mentor to him. The inherent ignorant racism towards anybody of Japanese dissent illuminates more of the kindness shown by this mentor. The boy learns a critical life lesson of giving everybody a chance no matter a preconceived notion. Also, the pastor of the town, played by the known Tom Wilkinson, tells this boy that faith will make people move things for you. He means that faith causes action for the good. The scene where that is said is so warming that I believe it is one of the best of the film. The little boy character learns to not be ashamed of believing in what is for the good. This film took 5 years to make and the set/location where they filmed was inviting to the audience’s eye. The small houses and the dock reaching out to the sea provided the perfect little town concept for a family story like this. When families or anybody watches this one has to remember the line of “Measure yourself from you to the sky”. This piece definitely produced some tears but it lifted me up. The film wasn’t too childish but it was maybe a little too lighthearted for the storyline. I would bring my family to this if I had one (meaning children).